Bythe time that you receive this bulletin, we will nearly be in the season of Lent. Ash Wednesday, celebrated on March 1, begins the season of Lent and is a universal day of fast and abstinence in our universal Church Lent is the yearly celebration by the Church of its corporate conversion in Jesus Christ. During Lent, the liturgy prepares catechumens to celebrate the Paschal Mystery by the various stages of initiation. It also prepares the faithful for Easter as they recall their baptism and do penance in preparation for the greatest Feast of the year. Lent has two major purposes. It recalls or prepares for baptism, and emphasizes a spirit of penance. Through forty days of closer attention to God’s Word and of more fervent prayer, believers are prepared to celebrate the Paschal Mystery. Lenten instructions stress these baptismal and penitential themes. Sin has social consequences. At the heart of the virtue of penance is hatred of sin as an offence against God. We encourage penitential practices that are external and social, reflecting the circumstances of individuals and communities, as we pray and do penance for sinners. We also stress individual and interior penitential practices. The three preferred penances of the Church are fasting prayer and alms giving. In our cluster we have a number of opportunities to get involved in the life of the Church and do penances at the same time. Just watch our Church bulletin. Thank you for taking one of the evenings and leading the Stations of The Cross, this prayer which has inspired Christians for centuries. As the Lenten season soon begins, may you have a blessed and good Lent. Ordinary Time is coming to a close. The Lenten Season begins on Ash Wednesday March 1. Let us use this time to reflect on our spiritual life as we grow in our faith. Each Friday during lent our parish cluster has the Station of the Cross Prayer Service where we come together and pray remembering Christ’s Suffering for our sins. The Knights will lead the Prayer Service on Friday March 10th. As a prelude to lent we are having another Shrove Tuesday Pancake Supper at our hall from 4:30 until 7 PM. Come out enjoy the comradery and support this fundraiser. Our Basketball Free Throw Council Level was well attended despite having to be rescheduled due to weather. Thanks to Br. Lorne Twamley for chairing this event and arranging sponsorship for the refreshments. Winners will now advance to the District Competition. At our Community Kitchen we severed over 100 people. Our Appreciation Dinner was enjoyed by all those who attended. Our Boston Pizza Night had a less than anticipated turnout, however a $ 570 profit was realized. Any Brother that hasn’t taken their 2nd or 3rd degree has any opportunity to receive both on Sunday March 12, 2017 in Hanover. Transportation will be provided, however names must be submitted by March 05, 2017. For Additional information contact Ken Gaffney. Finally I want to acknowledge the efforts of the Brothers & family members that delivered the phone books and to Paul Gras for allowing us to store them at his place as the hall could not handle the volume. These efforts raised over $ 3000. St. Michael C.S.S. 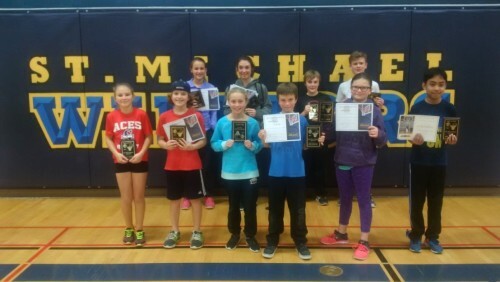 was the site of Council’s basketball free throw competition for the Catholic Elementary Schools on January 24. 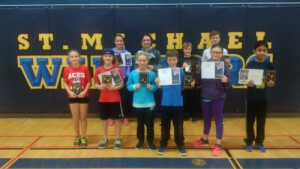 A boy and girl winner in each age group will advance to the District competition on Saturday February 18 in Kinkora. Thanks to Lorne Twamley and Brothers Jim Hurley, John Saman, Jim Gaylor, Gerry Culligan, Ken Gaffney, John Price, Jim Miron, Shawn Raiman, and Fred Debrick. Thank you to Tony Vigar, Jim Kelly, Harry Visser, Tom Gould, Bernie Van Herk, Larry McCabe, Lorne Johnston, Jim Miron and Helen Goforth for preparing and serving at the community meal at St. Joseph’s church hall on January 19. 102 people were served. Brother Mike Lobsinger has council members going around in circles. Come out to the next meeting to see what is going. 55 people came out to socialize and enjoy a well prepared appreciation meal for members and their partners. Reminder that members have until March 1, 2017 to book the hall for dates in November and December. After March 1, Harry Visser will book the hall to non-members.